Sorry to bore you with yet another water marble, but when the prompt called for rainbow nails, and I have a set of water marbling polishes sitting there in front of me in a full rainbow set, how could I not use them! This isn't actually the design I was going for, and is the second attempt at water marbled rainbow nails for the prompt. 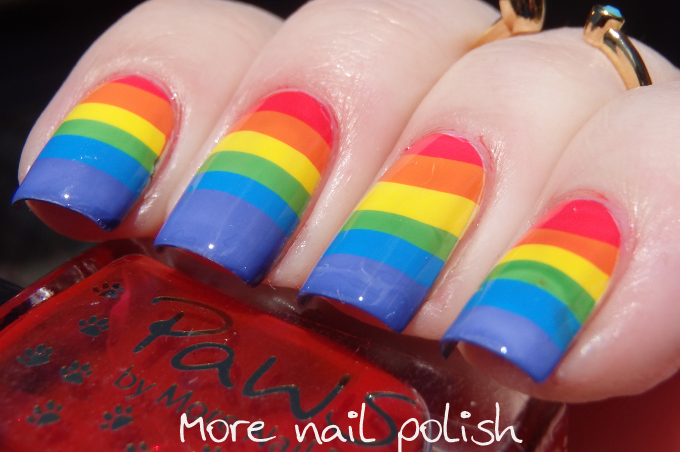 My first design was to try and create thinner lines with a nice rainbow arch across my nails, but I didn't like the placement I got, and the white polish that showed on the outside of the rainbow looked too stark. So I took them off without even photographing them! Now I probably shouldn't call this design water marbled, cause there is no marbling of the polish once it was on the water. Lets just call this water floated. Once the bullseye is placed in the water, just dunk your nails in. I did a few drops of red first, then the rainbow, and finished with a few drops of purple. This meant I wouldn't end up with any white polish showing on either the top or the bottom of the nail. But it also meant that if I didn't position my nails perfectly, then I would end up with too much of one colour. As you can see I have a bit too much purple and not enough red. But considering this was my second attempt, I stuck with it. Maybe I'll attempt my first idea again next year. 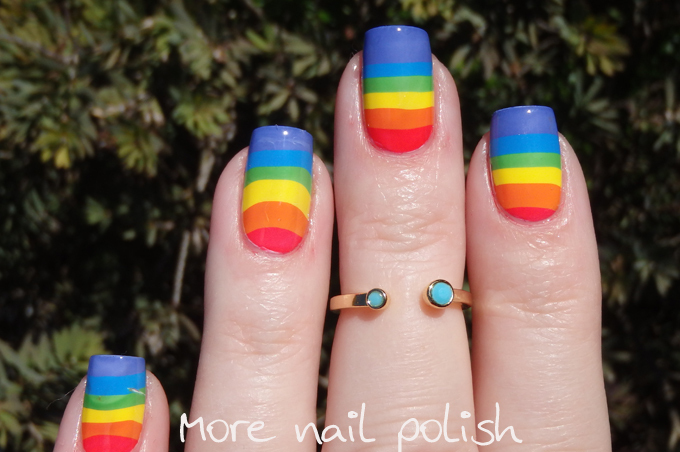 My rainbow nails from 2013! I like this gorgeousness!! 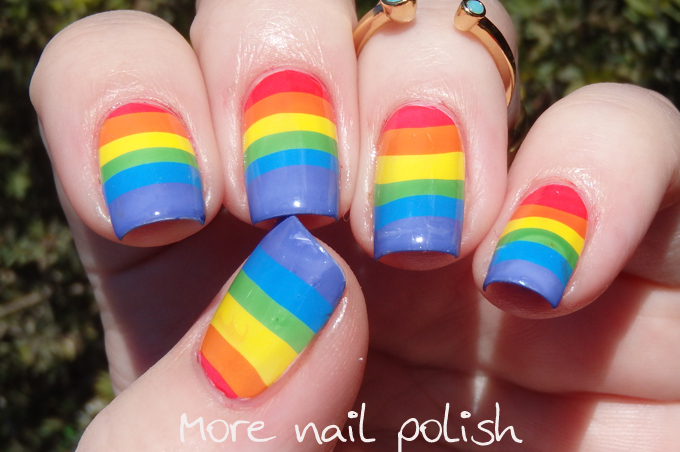 Love rainbow nails. 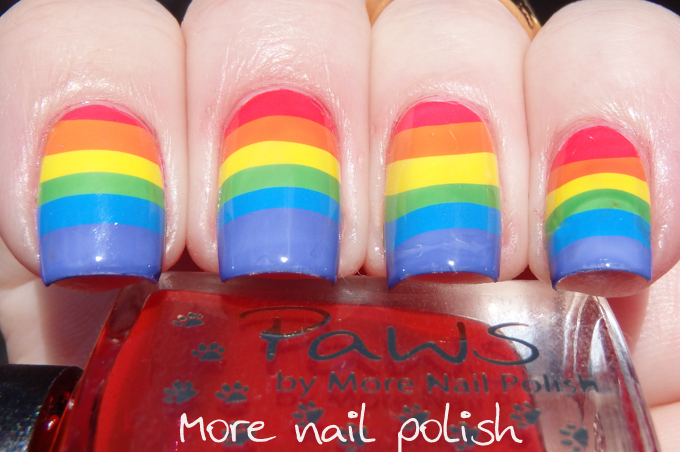 These came out perfect, love the look of your rainbows! What a cool idea :) I never thought of marbling-without-marbling... nice way to make stripes! It looks good. It still looks great. I like it without the dragged polish. The colours are really pigmented and strong. These are awesome!! Love how they turned out, and great idea! I'll never get bored of your water marbles! This looks really good! 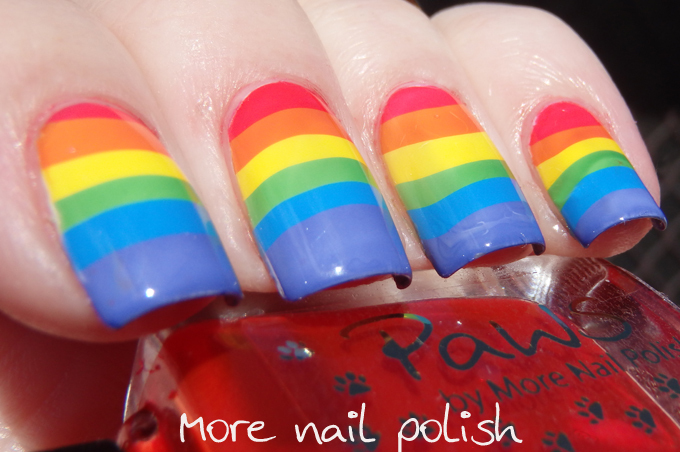 Love it :-) So bright and colourful!